2nd International Conference on Economy, Social and Technology (ICEST, 2019) are organize by Academic Inspired Network (AIN). 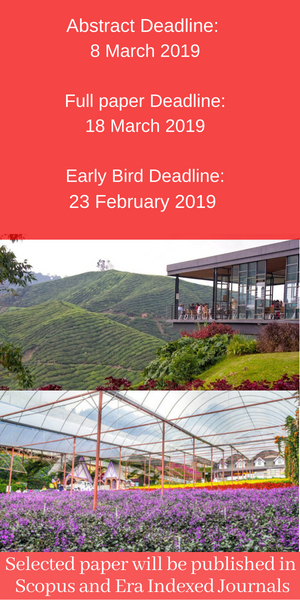 2nd ICEST 2019 will be held on 23rd March (Saturday) 2019 at Copthorne Hotel Cameron Highlands, Pahang, Malaysia. ICEST 2019 will provide the ideal opportunity to meet experts in entrepreneurship, management, business and researchers to debate and discuss the current issues worldwide as well as finding solutions to the problems, besides offering them to exchange and share their knowledge and experiences with others. Also, the conference provides an excellent venue for you to present your research and receive quality feedback. Therefore, scholars, researchers, practitioners, and graduate students are invited to submit their proposals/abstracts to be considered for presentation at the ICEST 2019. All interested parties can join this conference as presenter, non-presenter or listener by register the information through click the button sign in/register in the above this website and for presenter and non-presenter can submit their abstract and paper through click button submission when you sign in. For the information, the fees required for this conference are different according to categories choose (presenter, non-presenter and listener), besides that ICEST 2019 also provide fees for individual or group joining. Therefore, scholars, researchers, practitioners, and graduate students are invited to submit their proposals/abstracts to be considered for presentation at the ICEST 2018. All interested parties can join this conference as presenter, non-presenter or listener by register the infomation through click the button sign in/register in the above this website and for presenter and non-presenter can submit thier abstract and paper through click button submission when you sign in. For the information, the fees required for this conference are different according to categories choose (presenter, non-presenter and listener), besides that ICEST 2018 also provide fees for individual or group joinning.